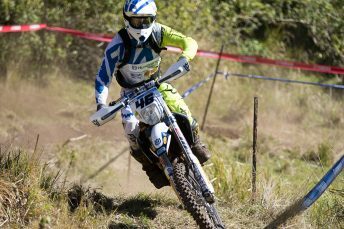 With the Yamaha Australian Off-Road Championship (AORC) now passed the halfway mark of the season, plenty of interest was fixated on the Senior classes to see who would perform in the first Enduro for the year. For the premier E1, E2, E3 and Transmoto EJ classes the victors would be Wil Ruprecht, Daniel Milner, Lachy Stanford and Fraser Higlett. There was plenty of excitement to see the return of the Enduro format to AORC after a two-year hiatus. Enduro is an extended cross-country, with Sprints/Special tests inside of it. It is a time-card event whereby a number of stages are raced in a time trial against the clock. The rider in each class with the least total elapsed time is declared winner for each of the classes. The senior riders adapted to the technical grass track extremely well. Despite the frosty morning, the temperatures soon increased to over 23 degrees celsius. Wil Ruprecht of the Active8 Yamaha Yamalube Team, had a phenomenal start to his weekend, delivering the Round 9 victory in devastating fashion. Ruprecht managed to complete the seven tests in an elapsed time of 59:46.196. Finishing approximately 65 seconds behind was Jack Simpson on his KTM, in a impressive return after missing Round 7 & 8 at Renmark. Simpson’s total time was a 1:00:51.240. Completing the podium trifecta was Brad Hardaker on his Yamaha machine, finishing just under a minute behind Simpson. His total Enduro time was a 1:01:42.568. The talent stacked E2 class could not stop KTM Enduro Racing Team rider Daniel Milner from continuing his impeccable unbeaten run in the AORC, as he marched towards another victory. His accumulated Enduro time was a 57:48.113. Milner managed to take a commanding victory, a further 89 seconds in front of his nearest challenger in Active8 Yamaha Yamalube Racing Team’s Josh Green. Green managed an accumulated overall lap time of 59:17.513. Finishing the top three in class was Riley Graham with a time of 1:00:57.355. Graham finished a further 99 seconds behind Green. In the EJ class (19 and under) that is designed as a development ground for senior riders, it would be Fraser Higlett on his Husqvarna to take class victory. Higlett was as an absolute force to be reckoned with today! Higlett posted an impressive 1:00:49.100. Up next in second was title rival Michael Driscoll on a Yamaha. Driscoll’s time of 1:01:18.769 putting him a further 30 seconds behind. Nic Tomlinson on a Yamaha was the final podium place getter. Tomlinson managed a 1:03:09:870, a significant gap to the other podium placers.